My ride was on a rainy day on an inland lake in Michigan. The weather did not dampen the experience. It won’t haul your boat to the fish camp or get you to the hunting ranch, but the Gibbs Quadski XL will handle everything when you get there, on land and on the water. An amphibious vehicle is an extremely effective ATV that, when driven into the water, becomes a highly stable and proficient personal watercraft for two. The original one-passenger Quadski was made available in late fall of 2012 and was the first amphibious vehicle introduced by a private manufacturer in more than a decade. Gibbs has been a player in the multi-mode vehicle market for many years and was the maker of the Aquada roadster which encountered some insurmountable obstacles. The company never wavered from its goal of producing multi-use vehicles, however, and the Quadski XL is the result of that commitment. 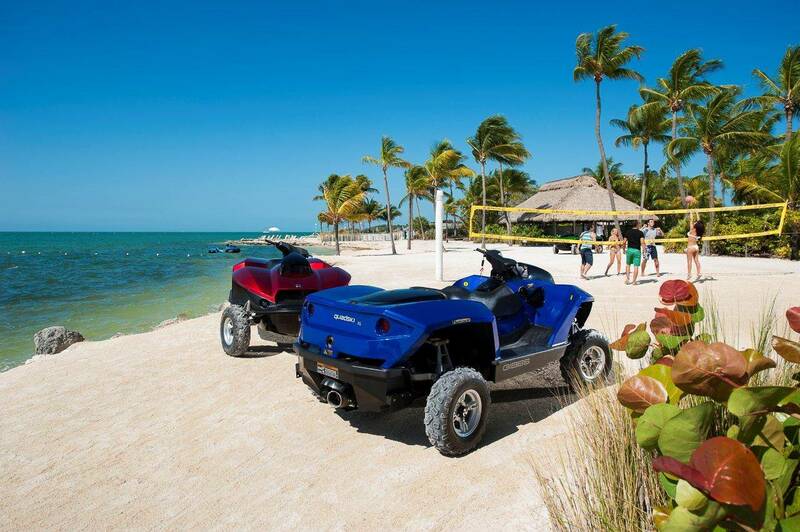 Dual-Mode Quadski XL is as functrional on land as it is on water. The new XL version of the Quadski is designed to fully accommodate two people — driver and rear passenger — for all activities. The unit is powered by the BMW Motorrad K1300 water cooled 4-stroke in-line 4-cylinder engine mated to a sequential electronically controlled with centrifugal clutch and electronically-operated land reverse gear. 98 RON premium plus unleaded fuel is specified. 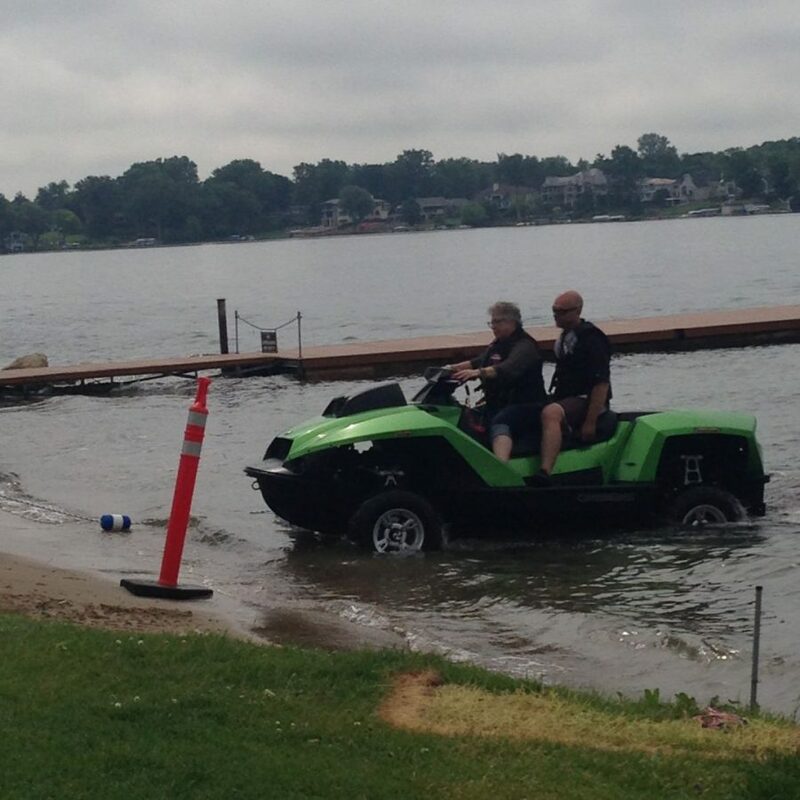 On both land and water, the Quadski can achieve up to 45 mph and the complete transition between the two modes takes about five seconds. On land, the rear wheel drive ATV utilizes 4-wheel disc brakes, a suspension system comprised of independent coil springs and hydraulic dampers; water function uses the proprietary Gibbs jet drive which is more compact and lighter than typical marine industry water jets and provides high levels of thrust and maneuverability. The hull is a monocoque dual skin composite with a cast aluminum blade of cast aluminum and a stainless steel 5 blade for the impeller. The drive unit is single stage mixed flow. I can attest to the fact that it is extremely stable, even under less-than-perfect conditions. 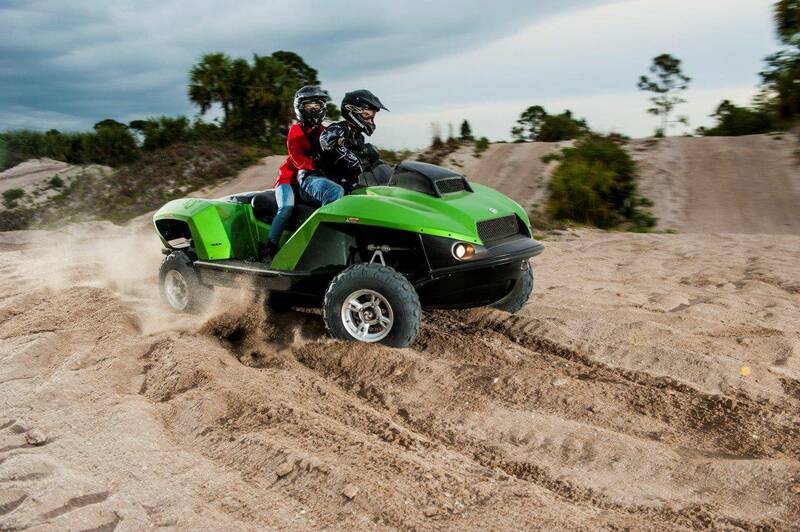 For towing purposes, the curb weight of the Quadski (without trailer) is 1,437 pounds with overall width of 62.5-inches/overall length of 140.2-inches and a wheelbase of 82.3-inches. I was a bit wary when I tried out the Quadski XL for the first time. Personal watercraft are not a favorite mode of transportation for me. I often find them to be under-designed for safety and ease of use. No similar problems with the Gibbs vehicles. I suspect that this is related to their dual purpose functionality. If it is designed for on-land stability, as well as water use, and carries the added weight of wheels, tires, suspension, etc., it should be more stable. Surprisingly, I found it — even with dual-mode capability — to be simple to use and steer in both modes. It is a genuine kick to take it from water to land and land to water, even if only to see how easy it is to operate. I look forward to having the opportunity for more land use since time was limited. My expectation is that it will rival the competition in its performance. The Quadski is being used by emergency services, police and the military, and it should have great application there. Recently, in Virginia Beach, VA, it instrumental in the water rescue of a young competitor in the 2014 United States Lifesaving Association Lifeguard Championships. Richard Szitich, a lifeguard from Sussex County, DE, rescued a youngster who suffered an asthma attack during a race for 9-to-12 year olds. He was able to reach the girl, pull her onto his Quadski, bring her to shore and drive her to a nearby medical tent. Standard colors for the Quadski XL are red, blue, yellow and silver, but custom colors and camo are available from Gibbs. 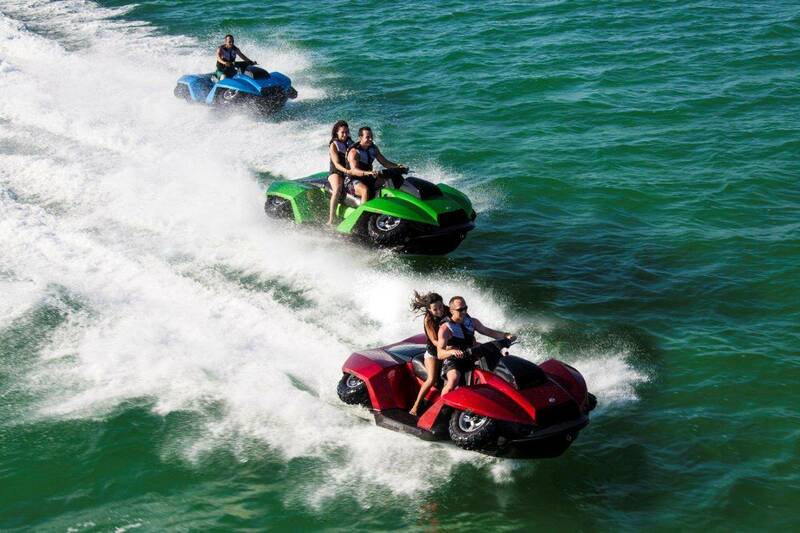 The company is putting a dealer network in place throughout the United States, but arrangements can be easily made to try out and order the amphibious vehicles now by contacting Gibbs.